ily, he learned the complex theory of WingTsun from his teacher. It is thanks to his outstanding talent as a martial artist and his incomparable commitment to the spread of Wing Tsun that the Yip Man style is now one of the world’s most popular martial arts. Leung Ting’s past story, like his present life, is colourful. It was said that he became ambitious ever since he was four or five years old. At that time he loved drawing – with a piece of chalk in hand, he could draw a warship large enough to cover the whole wall of his house, over-loaded with aeroplanes, guns, large chimneys, etc., for the trouble of his parents to rub them off! In his childhood, he was weak, though active. He would never sit quiet on his chair. He was a known troublesome boy in school, though he was not bad in his academic attainment. “Few teachers liked me,” Leung Ting recalled, “and big boys in the class often bullied me, I could not fight them over, and after all, teachers always punished me for the fight”. Prejudice and misunderstanding against him made him feel that he was always unfairly treated. That feeling resulted in his love for learning martial arts. He was determined to become a gallant-knight, a hero, who “fought bad people on his way and helped keeping justice”. Dramatic persons in famous kungfu movies became Leung Ting’s idols. But the one he most adored is the Monkey King, the imaginated character of the supernatural novel “Adventures of The Monkey”. What Leung Ting admired of the Monkey King are its naughtiness, its skills as being shown in the episode “Making a mess of the Heavenly Palace”, and its faith in his master, and the respect and protection it offers to him besides its ability to impersonate seventy-two different figures. Leung Ting’s boyhood, however, came to an end very soon as his days of play and fight passed away. He did not have a chance of learning martial arts from a kungfu master, not until he was thirteen. One night Leung Ting, his friend and a cousin of his friend were having a walk in a street. The cousin of his friend got into trouble with a gang of youngsters, who, taking advantage of their numbers, attacked him altogether. Leung Ting could not allow so many people to bully one. With an angry shout, he threw himself over the twenty or so outlaws! He regretted afterwards for having done so, he felt he was a fool to fight these youngsters, especially when his two friends had already sneaked away while he was busy fighting those people. However the incident was a meaningful experience for him, if he was determined to become an instructor of the Wing Tsun Style. Leung Ting had two maternal uncles, both were trained in Wing Tsun Kungfu and were famous for their fighting records. Leung Ting had all the time been requesting his uncles to teach him kungfu. However, Leung Ting’s father thought the boy was so naughty that he should not receive tuition in martial arts. It was Cheng Fook, one of Leung Ting’s uncles, who took another view of the boy after taking care of his wounds. He thought that a boy’s characters could not be changed, whether he was taught kungfu or not. So, he would rather teach him some skills of self-defence than to allow him to be bullied. With the approval of Leung Ting’s mother, Chen Fook sent the boy to a gymnasium of a Wing Tsun instructor who was the eldest headstudent of Grandmaster Yip Man. For six years Leung Ting worked hard in learning kungfu everyday. He was then eighteen, and helped his uncle Cheng Pak, who was also his elder kungfu brother, to set up a school, and became his assistant. Over-indulgence in learning kungfu had affected Leung Ting’s academic performance – he failed in the School Certificate Examination by being short of only one subject. He had the thought of ceasing his own schooling, if not for the cold sneer of one of his younger kungfu brothers. Being insulted, Leung Ting determined to read hard for one more year, and the next year he obtained brilliant results to become enrolled in Baptist College. Then he received news that his uncle Cheng Pak had already closed his gymnasium. To become a school teacher of kungfu instructor? By an opportunate chance, Leung Ting was introduced by Kwok Keung, his second elder kungfu brother, to Yip Man the Great Grandmaster and recognised successor of Wing Tsun Style. Not long before that time, Grandmaster Yip Man had for a period been hospitalized for treatment of stomach ache. Returning from hospital, Grandmaster Yip determined to retire from the management of his gymnasium and teaching of kungfu. In Chinese tradition of kungfu, that was to say, Yip Man had already “Closed his Door”! Yip never expected that he would have met the teenager Leung Ting, being fond of him, be willing to accept him as his last disciple and give him personal tuition of the most advanced techniques, being dreamt for by most of the other direct disciples during their lifetime, could hardly be revealed by this old man! In the winter of 1968, Leung Ting opened a Wing Tsun class in the Baptist College – the first Chinese martial art class to be run in a post-secondary institute in Hong Kong. Before this, there was never a kungfu class in any academic institute, because martial arts and martial artists were all the time being despised, and kungfu was merely regarded as tricky skills used by street fighters. It was therefore a remarkable event that Leung Tng could open and personally direct a martial art class in an academic institute. To attract students, Leung Ting organised a kungfu performance show, in which he and his favourite disciples took part. The show attracted a large crowd of enthusiasts, among whom some sixty became enrolled. The enrolment soared to over one hundred and twenty the next year. The class was then incorporated into the “Wing Tsun Classmates Society of Baptist College”. In December, 1969, Leung Ting held a “Wing Tsun Kungfu Show & Tournament” in the campus of Baptist College. The meanings of this event were three-fold: first, it was the first open demonstration and contest of Wing Tsun Kungfu ever since Grandmaster Yip Man began to promote the Wing Tsun System in Hong Kong. Secondly, though all the contestors in this event were students of Leung Ting, yet their performances were praised and highly rated. Thirdly, it was the only occasion in the life of Grandmaster Yip Man when he attended a kungfu show organised by his own disciples. Soon after that, Leung Ting was appointed Chief Instructor of the kungfu class in the Ving Tsun Athletic Association. As for Yip Man, he was glad to have Leung Ting to succeed him and to have a calm and peaceful retired life. In May, 1970, the Ving Tsun Athletic Association moved to the new site. Leung Ting took the chance to rent the old premises of the association for setting up his own gymnasium – the “Wing Tsun Leung Ting Martial-Art Gymnasium”. From 1970 to 1971, Leung Ting devoted all his energy to promoting the development of Wing Tsun Kungfu by organising public shows and T.V. shows, accepting press and radio interviews, besides sending his own students to participate in various tournaments. With the help of his younger kungfu brother Cheng Chuen Fun, his own brothers Leung Lap, Leung Koon, Leung Tuen, and some other headstudents, Leung Ting succeeded in setting up Wing Tsun classes in several civic associations and organisations, and indeed had brought the populace to the knowledge of the existence of the Wing Tsun System. As a result of their publicity work, large crowds of learners flocked to Leung Ting’s classes. The rapid expansion brought to him a side-effect – that many fellow kungfu brothers became to misunderstand him and dislike him more and more. Something did eventually happened. At this moment, Leung Ting, besides managing the affairs of his own gymnasiums, was helping two of his friends in publishing an international martial art magazine – The “Real Kung Fu”. Leung Ting wrote in several issues of the magazine. Among his essays, one was particularly worth mentioning – “Seeds of the Wing Tsun System,” which was also printed in series on the “New Evening Daily,” and the “New Martial Art” magazine in Hong Kong and Asia. These caused jealousy and discontent among publishers of two other similar martial art periodicals, who were then prepared to take revenge actions against Leung Ting. In the Autumns of 1976 while Leung Ting was having a visit to his branch gymnasiums in Europe, he received a letter from the Rediffusion Television of Hong Kong inviting him to organize a martial art programme. On the one hand, Leung Ting was promoting publicity for the TV programme, and on the other hand, he decided to take “Real Kung Fu” as the title of the programme. An editor of an amusement and entertainment publication had an interview with Leung Ting, in which Leung Ting forgot to clarify his own position. The next day news about Leung Ting came over the front cover of a newspaper. Worse still, he was crowned with the title of the “Leader of the whole Wing Tsun Style”. It is not unusual to see wrong informations in newspapers, which are usually corrected on the next issue. But wrong information about Leung Ting was at that moment particularly irritant to fellow kungfu instructors of the Wing Tsun style. This was certainly the best chance for revenge! Instigated by two jealous publishers, the next day, several newspapers disclosed news of the “Successor Event” on the front pages, and few people noticed the “correction notice” on the newspaper that first disclosed news of Leung Ting. This was only the prelude. The climax of the incident came when a “Press Conference on the Successor Event” was scheduled to be held by a group of angry protestors and their invited kungfu aides, who meant to publicize the mistakes of Leung Ting. But one day before this conference, Leung Ting, with the help of the TV station and a newspaper editior, the one who felt sorry for giving Leung Ting trouble, rushed to hold a “Press Conference to clarify the successor event”, in which Leung Ting pointed out that the whole thing was not just a planned plot to blur his name, but that those who stood out against him were merely instigated to do so by some people who actually planned to take over his TV programme for themselves. Leung Ting further pointed out to me that he had “learnt a lesson” from this incident, that he had seen the real face of the so-called “respectable martial art seniors”, and that he himself had been too frank towards others. 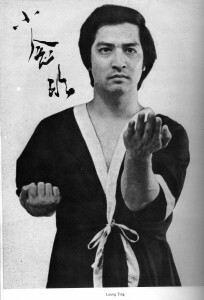 The “Successor Event” had finally brought Leung Ting more honour than insult, as reflected in the fact that the “Real Kung Fu” TV programme, in which a large number of kungfu masters, including numbers of two big martial-art general associations appeared to support it, became a favourite item. As a side-effect of this, the number of students attending his gymnasiums grew unexpectedly fast. In the Summer of 19877, Chang Chieh, in a press conference, with straightforward and simple words, introduced Leung Ting to the public as the new kungfu action director of his company. That is how miracularly Leung Ting jumped from the martial art circle to the movie world. More than 20 years later GGM Leung Ting re-entered the movie circle. Though being successful in the movie circle, Leung Ting was all the time worried about his own ability for his new job, especially when he realized the complicated inter-personal relations in the movie circle. The next year, when he had finished directing the sixth kungfu film, he returned to his own gymnasium. One month later, he had a tour of two months to Europe. Having a view of the beautiful scenery of Europe and having seen his students who were growing in great numbers, Leung Ting finally fond out where his real interest lies. After his return to Hong Kong, he re-arranged his manuscripts on martial arts, and put them into print at the end of 1978, which became the first volumous book on a selected Chinese kungfu style in English edition, with the title “Wing Tsun Kuen”. It is not known how many of his students exist in other countries. In all these countries, there are different political thoughts, different habits of life, different races of people, and different languages. But when all these people come into the gymnasiums or brand gymnasiums of the IWTA, they all do the same thing, that is to bow first to the image of Yip Man the late Grandmaster, then to the photo of Sifu Leung Ting, the Grandmaster of their kungfu system, before paying their respect to their own masters or kungfu instructors, as commensurate to the tradition of Chinese rites. In this way, Leung Ting is not only teaching kungfu, but also teaching Chinese culture.